The origin of the cam isn't clear but since the industrial revolution, they're present on almost all machinery where something or the other rotates. A cam, as you might know, is an egg-shaped metal part and in our world, it has the job of operating the intake and exhaust valves of the engine. But cam shapes and sizes vary depending on the job they're required to do. Where else? Railways, oil refinery pumps, shipping, dredging, aviation, cranes and many many more applications use them. What do they do? They simply convert rotating motion into something else. They're extra vital when the timing of this conversion is crucial. In internal combustion engines, they convert their rotational motion into precisely timed opening and closing of valves via pushrod or rocker arm actuation. You could also think of cams as a way to employ any rotating shaft to do other jobs in addition to its primary task. 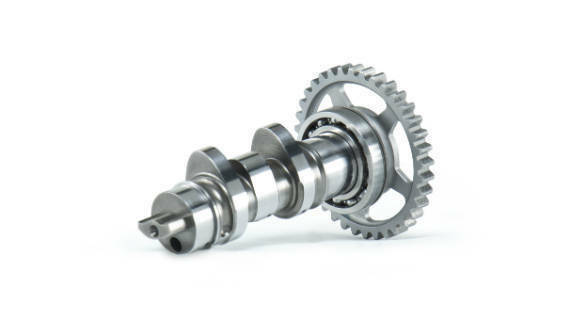 Which, more or less, is how a rotating crankshaft (converting air pressure into rotation) ends up controlling valve timing - using a chain/gear-driven camshaft. 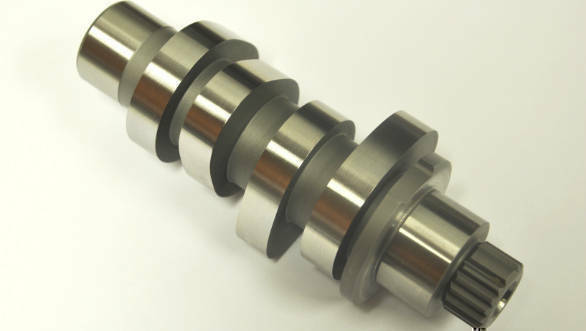 The camshaft, of course, is a 'rod' which can rotate and on which multiple cams are mounted. A valve-operating cam normally uses three distinct curves. We call these the profile and it endows the can with its egg shape. The bottom of the cam is usually a constant radius circular curve. This is the base circle. The middle part gradually changes the radius, sort of like a circle trying to become a straight line. The top-most part is the peak and it's got the sharpest curve. When the end of the valve sits on the base circle, there's no pressure on it and so the valve springs keep it closed. As the cam rotates off the base circle, the pressure on the valve stem increases causing it to start opening. At 180 degrees of cam rotation, directly opposite the middle of the base circle, the sharp radius will put the maximum pressure on the valve stem, and this marks the point where the valve opens to its fullest. As the cam continues, it goes off peak and heads back towards the base circle, closing the valve again. Meanwhile, another cam, positioned at a different orientation could be operating another valve. In any engine, multiple cams are busy opening or closing each of the valves. Each cam is profiled to produce a precise timing and quantum of valve opening and closing. Remember the electric distributor? Not so many years ago, that and the fuel pump both also used cams. Your windshield wipers still do. Another famous but unknown use case are propellor-equipped fighter aircraft with centre mounted machine guns. The pilot fires his weapon at the enemy without destroying this propeller which the bullets must pass through! Yup, that isn't the pilot's superhuman skill at all. It's a cam connected to the propellor shaft that fires the gun at the right time! The pilot's just holding the trigger. Oil wells have cams that work the huge piston and valves that the pumps use to extract oil. Forging machines, similarly, have cams that literally beat the shape out of anything you place in the machine. Motorcycle throttles also have cams on their throttle grips that convert your wrist movement into torque demand. Some can vary how sensitive the throttle is across the rev range. Small aircraft will still use cams to work the control wires that work the mechanical connection to the control surfaces - rudders, elevators and ailerons. Steam locomotives had cams attached to their wheels which were linked to operate the steam valves in a fairly complex method. Ships have massive cams that run their gargantuan engines. There's a lot of cams about. But like all mechanical systems today, the cam is slowly being replaced. Just like the fuel pump and the distributor no longer need a cam, other methods of valve actuation are being tried out, most notably in motorsport. Why? Come back next month for a discussion on the debacle of the cam and the rise of electronics.